A mini school bus with children aboard struck and killed a woman in Queens early Tuesday, in full view of the kids, who had to sit in the vehicle as cops covered up a body lying right next to the driver's door. Ida Siegal reports. 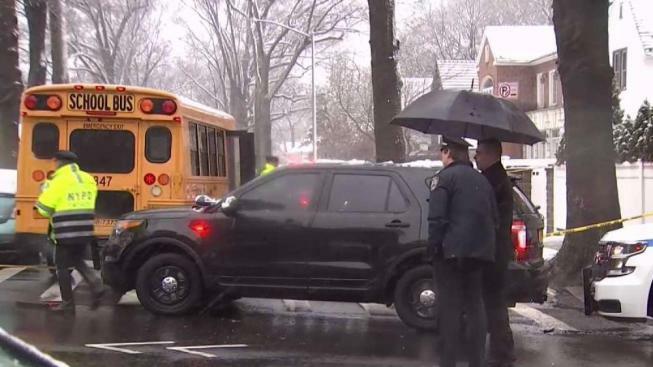 A mini school bus with children aboard struck and killed a woman in Queens early Tuesday, in full view of the kids, who had to sit in the vehicle as cops covered up a body lying right next to the driver's door. Three children were on board the bus when it turned onto 82nd Avenue from Kew Gardens Road at about 6:45 a.m. and hit the woman, identified by police as 58-year-old Elise Hellinger. The driver and bus matron were also on board. Video from the scene shows multiple ambulances responding, yellow caution tape cordoning off the area as snow falls. Highway NYPD patrol cops help unload children from the back of the bus, some of them sobbing. A school bus carrying three children in Queens hit and killed a woman as she was walking, police say. Ida Siegal reports. The children appeared to be shaken, but not injured. Logan Bus Company said it was devastated by the accident and was fully cooperating with the ongoing investigation. "Our thoughts and prayers are with the family," the statement said. It wasn't clear if authorities believed weather contributed to the crash.